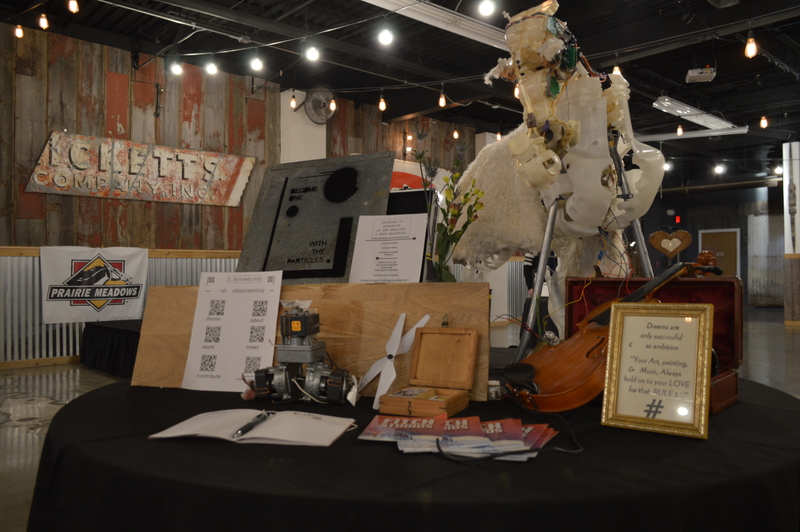 On October 18th, the moody lighting and rustic decor of the Decades Event Center in West Des Moines hosted a showcase for the Area 515 Artists in Residence program. This program was sponsored Prairie Meadows and Bravo! Greater Des Moines. It provided memberships to the Des Moines Maker Space for 4 artists in the metro. 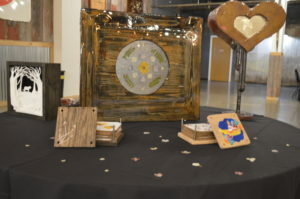 Artists combined their creative energy and unique visions with the special tools available at the Maker Space throughout the program. 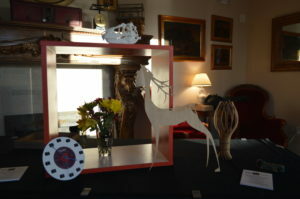 They displayed their projects and personal works at the show at Decades. 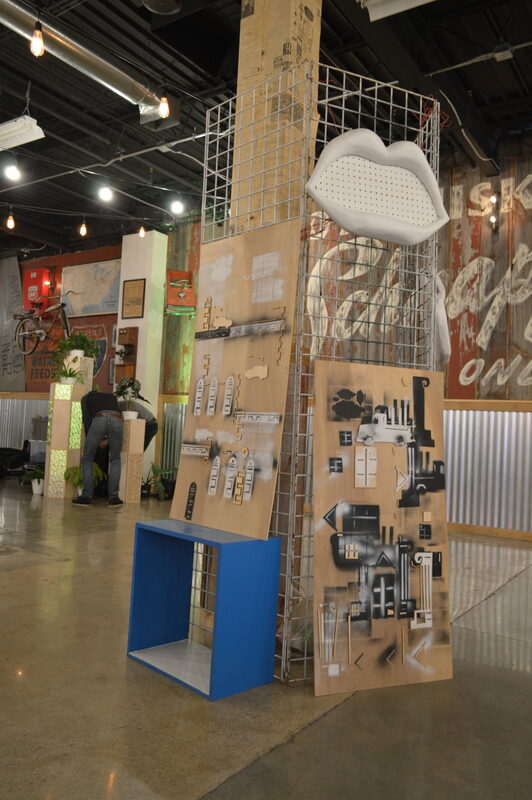 Shelly works large and small in a variety of mediums from drawing and painting to sculpture. 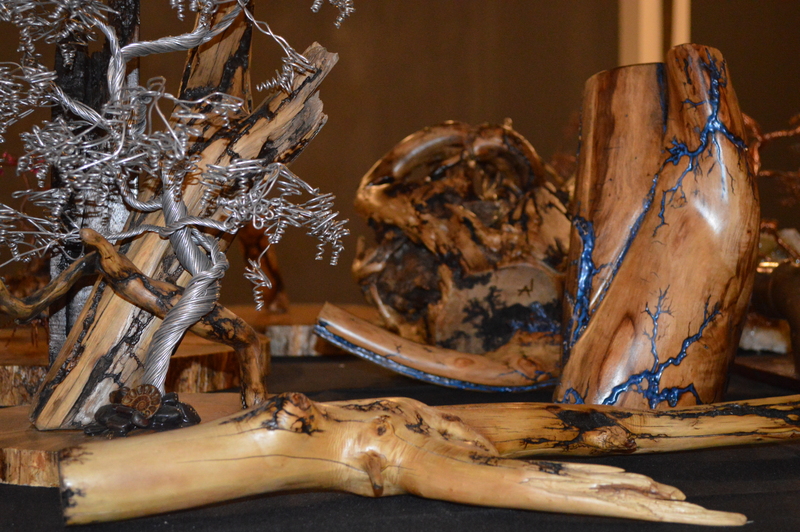 She works in wood, metal, and found objects. At the show, she showcased her laser cut work and electronic found art sculpture. 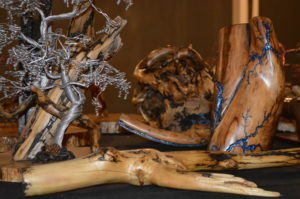 You can find more of Shelly’s work at her website. 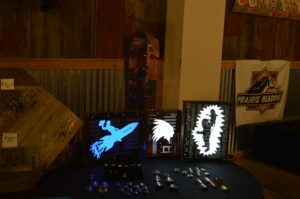 Much of Nate’s work makes careful use of recycled computer circuit boards. He removes the protruding pieces then carefully sands down the boards until he’s left with bare copper buses against colored plastic. He then seals the boards so the copper will not tarnish and works with a jewelry saw to hand cut pieces for light boxes and one-of-a-kind jewelry pieces. He also works with precious metals such as silver to individually craft custom bike badges. 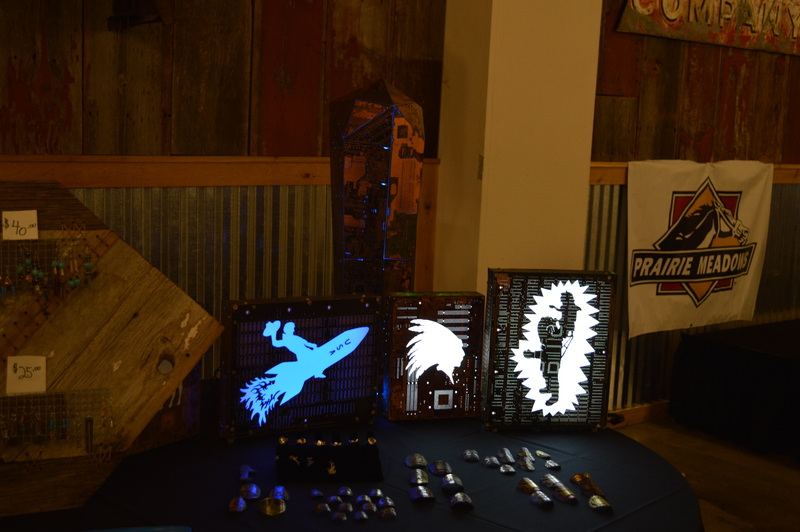 During his time with Area 515 he learned to work with the laser cutters which has given him the means to simplify the creation process for his pieces. You may find more work by Nathan on his Facebook page. Mia’s pieces are of an organic nature and the prevalence of wood and flowers in her work is accented by her use of resin. The focal point of her most prominent piece shows real flowers and leaves preserved in a clear resin at the center of a small wooden table. Reminiscing on pressing flowers as a child, she also showcased two presses she built along with many already-pressed flowers. Finally, she displayed a light box within which she had cut many layers of scrap book paper by hand with a precision X-ACTO knife, creating a haunting nighttime scene with dimension and depth. 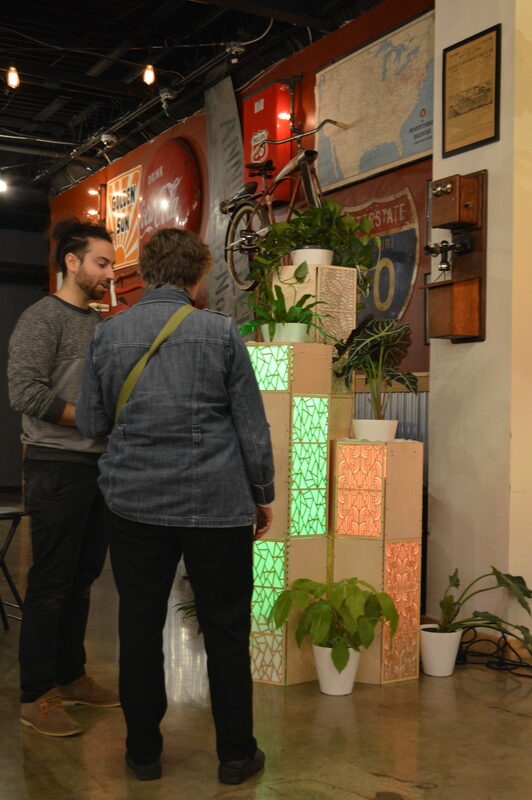 Gabe and Jeremy of PlantLed Creations built monoliths with laser cut birch plywood paneling to showcase their project that centered around plants and technology. The monoliths serve as a unique and dynamic conduit for the unassuming plants that sit atop. 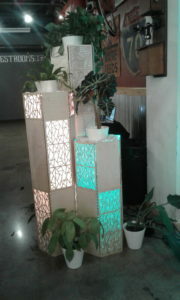 Each plant was part of a circuit that responded to their envrionment and sent signals to MIDI outputs for lights and synthesizers. These signals change according to things like the amount of water and calcium throughout the plant, and adjusts in real time to stimuli, such as being touched. This program as well as the artist’s showcase event were made possible through grant funding provided by Prairie Meadows and Bravo! Greater Des Moines, which the maker space sincerely thanks for this enriching opportunity.